All technology can kill people. Sometimes directly, but usually indirectly. And almost always at very low rates. Engineers and scientists work to identify these rates so that companies and society can prioritize resources to do the most good. However sometimes public opinion demands attention to areas that are not, and should not be, priorities. When you look at any issue deeply enough, most of the damage is due to small effects adding up. It’s not from a single incident. I could make arguments about gun use or airplane safety or chemical exposure or tobacco use or a million other technologies, but let me just look at a few issues that relate to energy consumption. Coal is a major killer in our electricity supply. Nothing is completely safe, but coal has the highest deaths per kWh. The CO2 emissions are causing climate change and the non-CO2 emissions are causing respiratory problems and premature deaths. However, the public wants cheap electricity and 1,000,000 premature deaths spread worldwide annually aren’t as newsworthy as an explosion at one plant. Japan is reeling from their change in energy policy after Fukushima. Maybe 100 people are expected to die prematurely due to radiation exposure from the event, but somehow that rate of risk hasn’t been demonstrated to the population. Since there has been so much fear-mongering about radiation, Japan has increased their use of fossil fuels in the electricity supply by 50%. The extra use of fossil fuels in Japan will kill more people each year than the entirety of the Fukushima accident. In the US, more than 30,000 people die each year from motor vehicle accidents. 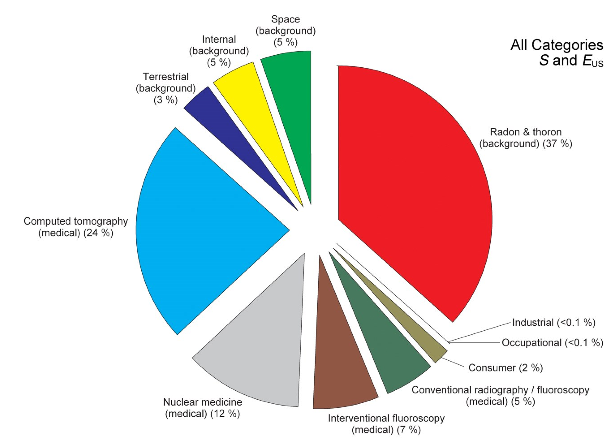 All nuclear radiation accidents worldwide (from power production and medical use) added together total around 5,000 deaths. But do people recognize these risks? I challenge you. If you value human life, start caring. 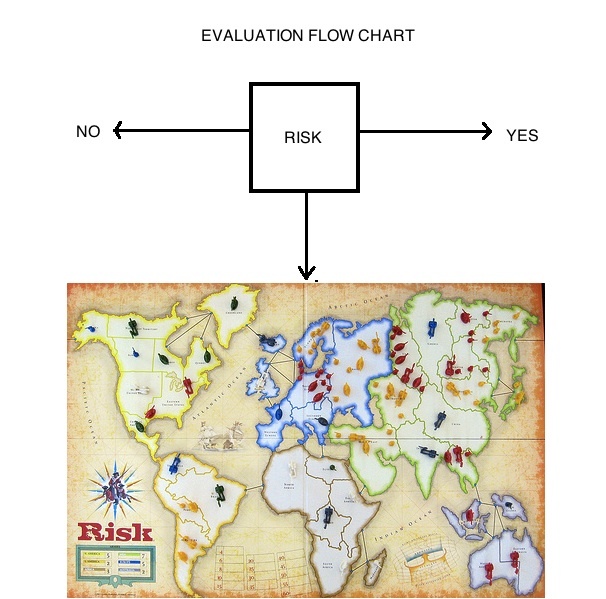 Look at the real risks and start contributing to making the world safer. Recognize that newsworthiness has almost no correlation with real dangers. Use less electricity, acknowledge driver error is the cause of most accidents (and it doesn’t always happen to other people), vote for policies that actually make people safer. There are many ways to reduce your impact, but today I’m going to talk about heating your home or apartment or living space. Clearly, there are three ways to reduce the needed power. Reduce the temperature difference, reduce the leakiness, and increase the efficiency. The temperature difference depends on the temperature set by the thermostat and the temperature outside. You can’t control the weather, but you can change your thermostat setting. 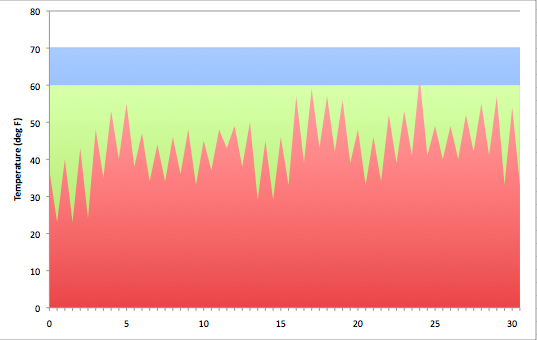 The figure below shows a month of temperatures and thermostat settings. If the setting is 60 deg F, the green area is the indicator of power needed to heat the house. If the setting is 70 deg F, the green and blue areas are needed (a 58% increase). The easiest way to reduce your needed power is to put on a sweatshirt and lower the thermostat. Maybe 60 deg F (saving 37%) leaves you too cold; you can still save 19% by reducing the temperature to 65 deg F. Remember, the point is to keep the room warm for humans. If you’re at work, turn down the home thermostat. Programmable thermostats start at just $25 and some utilities even offer rebates to make them free. Alternatively, make sure your workplace doesn’t heat itself when no one is there. This is the rate that energy escapes the house through walls and windows. It depends on the temperature difference too. There are many programs (like this one in Oregon) that can evaluate your house for leakiness. Adding insulation can save up to 40% of your heating costs by reducing heat loss. Let’s say you have a natural gas powered heater. The gas is combusted and the heat is exchanged to the air in your house. Some heat is lost in the exhaust and some energy is needed to blow the air around your house. Maybe 90% of the energy released from the natural gas is heating your home. If you have an electric heater, 100% of the energy is released to the house. However, this is only half the story. Remember, some forms of energy are more valuable. If natural gas was used to make the electricity, maybe 40% of the gas’ thermal energy was converted to electricity. So if your electricity mix is heavily fossil fuel powered, it’s more efficient overall to have a natural gas heating system in your house. However, heat pumps offer a much better “efficiency”. In a heat pump, electricity is used to move heat from outside air or the ground into the house. Heat pumps can be around 300% to 400% “efficient.” Many people would avoid the use of the word efficiency here, but our equation still works. This works since electric energy is more useful than thermal energy. So if you switch to a heat pump, even coal fired electricity is better than a home fossil fuel heater. The best options for reducing your heating consumption are to turn the thermostat down, stop leaks from your house, and switch to a heat pump. Often there are incentives and/or groups to help you increase energy efficiency in the home. You can save money and save energy. Many people might fear radiation, but there is no reason to. Everybody experiences small doses. Even exposures during nuclear accidents and clean-up are relatively low. While ionizing radiation has been linked to causing cancer many other substances, some naturally occurring, are more dangerous. Let’s look at some basics. Radiation is all around us. All light is radiation. When people talk about radiation protection, they really mean “ionizing radiation” protection. Ionizing radiation is any radiation that has high enough energy to ionize (eg. eject an electron from) an atom. Ionizing radiation can include high energy UV rays and X-rays, but in nuclear engineering there are two main categories of radiation. Charged particles interact all atoms, so they do not penetrate very far into solid material (eg. skin). The main risk to humans is only if the charged particles are taken into the body (eg. ingested or inhaled). Neutral particles, however, can travel much further in even solid material. When they do interact, charged particles are created which then can cause damage internally. The unit of absorbed dose is the rad. It is defined as 0.01 joules absorbed per kilogram of the absorbing material. It depends on the energy deposited, but also the material. Dose rate is also important; it is measured in rads per unit time. Ionizing radiation interacts on different length scales, certain radioactive atoms can accumulate in specific organs, and different organs respond differently to radiation. This means that the biological effect of a dose, or dose equivalent (measured in rem), can be as much as 100x the dose (measured in rad) though usually just 1 to 3 times higher. The goal is to estimate the effect of radiation on humans, so the dose equivalent allows different interactions in different areas of the body to be represented as one number. That said, dose equivalent rate (rem per time) is also important in estimating detrimental effects. We all experience some exposure to background ionizing radiation. Cosmic rays rain down from the skies and the ground emits radiation from uranium and radon. This varies based on where one lives. We even ingest some naturally occurring radioisotopes like carbon-14 and potassium-40. In addition to natural background radiation, we also experience some man-made background radiation. These include sources like certain medical treatments and nuclear weapons testing. Here are some data for the average American in 2009. It should be pretty clear that natural background and medical treatments are the main sources to which Americans are exposed. 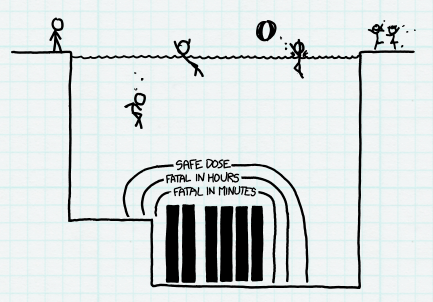 Even in the spent fuel pool of a nuclear power plant, radiation doses can be surprisingly safe. Fission sometimes occurs when certain unstable atoms (eg. U-235) collide with a neutron. This collision can split the atom into two smaller atoms and several more neutrons. If the freed neutrons split other unstable atoms, a chain reaction can occur. In power reactors, the goal is to sustain this chain reaction so that a stable amount of heat is released. However, neutrons can travel at different speeds. Neutrons from a fission reaction are usually very energetic (around 1,000,000 eV). In typical light water reactors (LWRs), these fast neutrons are either absorbed in U-238 or bounce around in a moderator (water). As the neutrons bounce around, they lose energy as the water molecules gain energy. Once they are “thermal” (around 0.025 eV), the neutrons are 1000 times more likely to split the U-235 than at “fast” energies. All of today’s commercial reactors exploit the thermal neutron reactions. Another way to release heat is to exploit fast neutrons. That means some different advantages and disadvantages. Many nations have experimented with fast reactors. The US program was canceled in 1994 but before that, the experimental EBR-II (19 MWe) produced more than 2 TWh of electricity from 1963 to 1994. France attempted a commercial project called SuperPhenix, which ran from 1985 to 1998. It was shuttered due to problems with corrosion and excessive costs. Russia, India, China, and Japan have fast reactors still in operation.